SYPHILIS IS by no means a disease which invariably acknowledges a venereal origin. . . . This patient had a very severe type of disease. 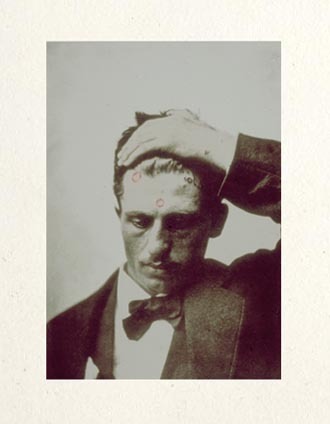 There were present nearly all of the usual symptoms, and treatment had little effect. . . . October 22d—Syphilitic papules; a few on the forehead, and a number of small crusts on the scalp. Closer examination revealed a dark-red patch on the gum, which, according to the patient had been swollen and hard for two months or more. The patient's little daughter, eight years old, had also come to the dispensary with an eruption on her body. She had a large ulcerated patch on the inside of her lower lip. Her health was impaired, and, according to her father's statement, she did not look or act as she had done before. Here evidently was a second case of syphilis resulting from an oral chancre. I now made a prying examination into the affairs of the family for the preceding year, and learned that about eight months before they had a boarder, a woman, who had whitish sores on her lips. She was accustomed to play with and fondle the patient's little son, two years old, who soon got a sore on his tongue, with lumps in the neck, and afterwards had a copious eruption on the body. Next, the wife and mother, who was pregnant at the time, acquired a sore mouth, with submaxillary swelling, followed in a month or so by spots over the body. Then the daughter became infected, as already described, and lastly the father. November 21st--To-day the mother came to the dispensary. The baby, five weeks old, was covered with papular eruption, which had appeared suddenly four days before, and had spread rapidly from the head over the whole body. The infant soon died, and what this family suffered, through no fault of their own, but merely from the unfortunate circumstance of having kept a syphilitic boarder, the reader can readily imagine. Scores of such instances doubtless are occurring of which no record is made, no history written. into bits of failing flesh. "We will soon bring him down." as will the rest of them. who will care for her? they'd promised her and planned. benevolent chained us in nature's links. The Making only cared for life itself. the long journeys without meaning.